A few months ago I summarized my experiences starting and initial usage of Carbonite. Remember Carbonite is a popular and excellent way to back up your important files to the cloud. I use Carbonite as my doom’s day backup to supplement my local backup strategy. Also in an earlier post, I pointed out that Carbonite does not automatically back up your Photoshop Elements Catalog. You have to manually direct it to do that, which is not difficult. I like Carbonite and it seems like a good product, one by the way that I hope I never after to see just how good it is. Carbonite has an optional free iPad app, Sync and Share, that allows you to access your backed up files from anywhere from your iPad/iPhone – and probably all smart devices. I installed it and also the small computer program on my PC. To be honest, I never tried using Sync and Share in the couple months I had it on my PC and iPad. 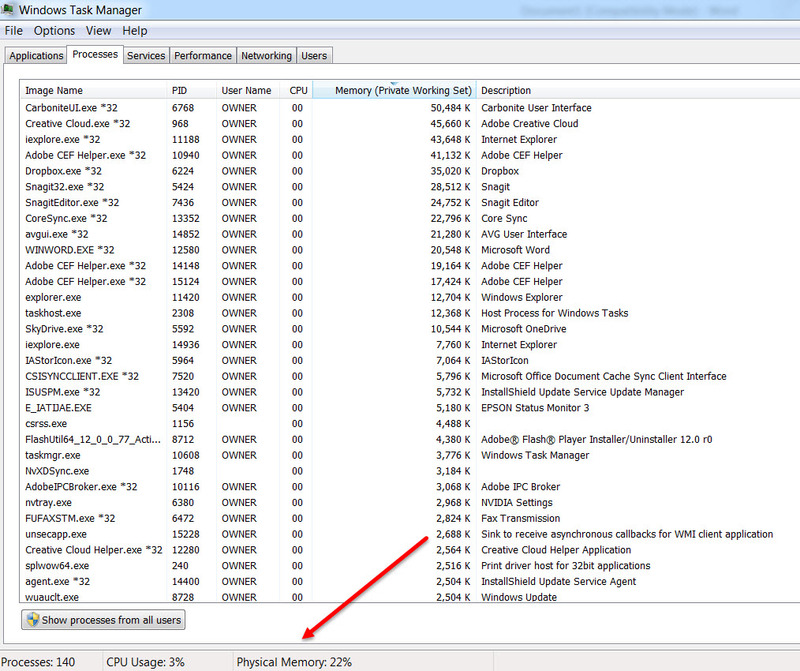 I was experiencing some probably unrelated PC performance problems and was using the Windows Task Manager to see what was going on. To my amazement, Sync and Share was using 3.8 Gb of my 16 Gb of internal RAM. That was an order of magnitude above any other program/process on my PC. I contacted Carbonite to verify that I could just uninstall the Sync and Share program in the normal manner without affecting my Carbonite backups. I did indeed uninstall Sync and Share and removed its companion app from my iPad. As I write this, the largest memory using program/process on my PC is only 118 Mb (OneNote), and I’m using about 22% of my total PC memory. Your mileage may vary, and there may have been steps that I could have taken to reduce Sync and Share’s use of my PC’s resources. But for me, I am sticking with the plan vanilla Carbonite that is doing what I expected. I am a long time user of Photoshop Elements, especially its Organizer to help me manage my very large Catalog of photos and videos. This use includes relying solely on its Backup/Restore commands to protect both my pictures and my Catalog file. Recently I have begun to also use Carbonite as part of my overall backup process. I am still learning about this popular program for backing up your computer files to the Cloud. After my system completed its initial Carbonite backup (two months in my case due to the extremely large number of files and requires storage space) I discovered that after all of that, it had not backed up my Photoshop Elements Catalog file. 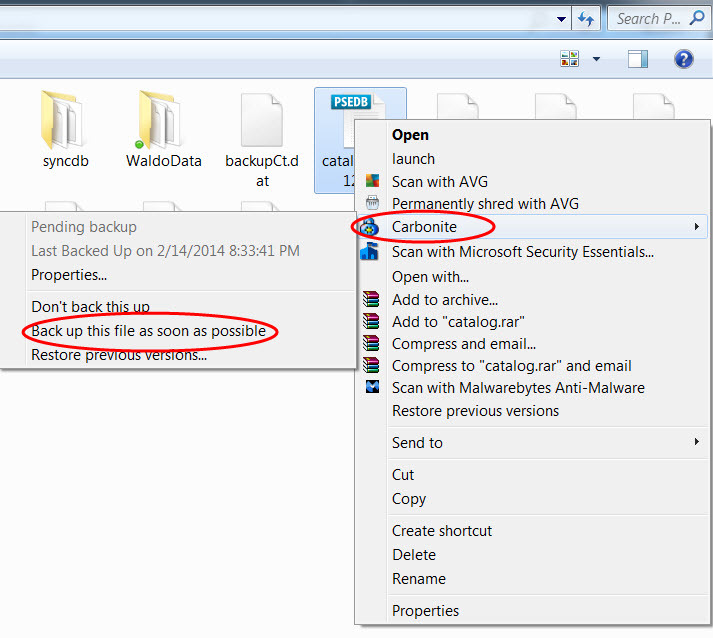 Files that Carbonite has backed up and will keep current have a very tiny green circle in the lower right corner of their file name when viewed with Windows Explorer. Here is what you do to verfy that your Catalog file has been backed up. Within in the Organizer, click on Help > System Info. In the dialog box that opens, the Current Catalog section shows the filename of your Catalog and the path to it. Note it leaves off the file extension which is .pse12db if you are using PSE 12. The 12 is the PSE version number. Using Windows explorer, navigate to the Catalog file and verify it has a tiny green dot in its lower left hand corner. If it does not, right click on the file, select Carbonite > Back up this file as soon as possible. 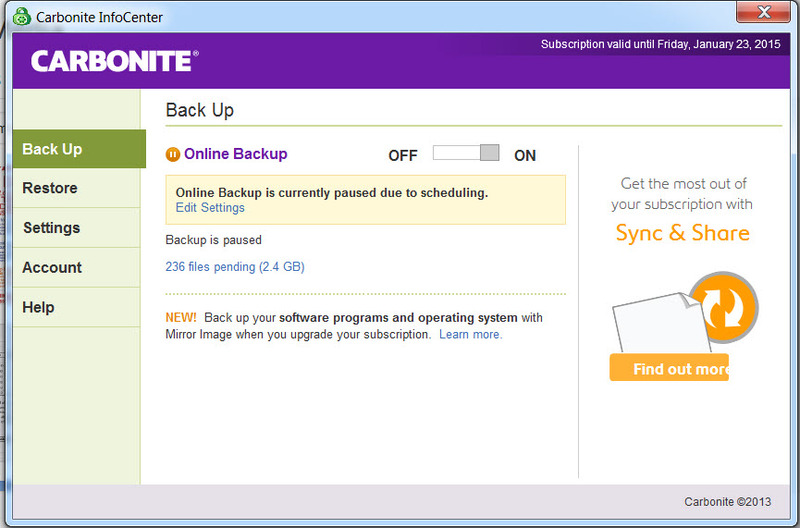 Now the next time Carbonite syncs your backup, the Catalog file will be backed up. As it turns not, for a variety of reasons, my Catalog is not stored in the default location. That could by why it was not backed up during the initial Carbonite backup of my system. If you like many of my students do rely on Carbonite or a similar cloud-based or local automatic backup program, make sure your PSE Catalog is part of that backup. If it is not, add it manually. Otherwise all of your tagging, captions, and other information that you have added in the Organizer will not be backed up. Sometime around midnight of December 31st, my initial backup using Carbonite was completed. I actually started the initial backup in mid-November as I commented on in this post. As the initial backup was being done, I really did not notice any performance hits in using my computer. I did leave my computer on for the most part, which is my usual practice. So as of right now, I am backing up 148,940 files that consume about 486 Gb of cloud storage. The bulk of those files and the storage space they consume are due to photo images. Now that I have completed the initial backup, I will find out a bit more about Carbonite itself. For example, my video files, which also take up a lot of local space were not part of the initial backup, but I understand that I can back them up manually using Carbonite. As I said earlier, Carbonite is kind of my doomsday backup. I will continue to back up my data files and photos/videos in my normal manner. But it is nice to know that Carbonite has my back. I am interested in your experience with Carbonite, especially how it worked out for you for recovering destroyed local files. Please share your experience and thoughts in the Comments below. If you have followed my blog, you know I have a large collection of pictures and videos that I manage using the Organizer of Photoshop Elements. And I use its Backup/Restore commands to back up my media and the Catalog itself. This has worked well for me over the years. I’ve even described my process in previous posts. Here is the link to one of those posts. You can find other related posts by searching my blog using the “Search My Blog” text box located further down the page in the right hand column. I also use an old program called Karen’s Replicator for periodically backing up my other important folders and files. It also has worked well for me. A couple of weeks ago, the C Drive on my “business” computer (in contrast to my “photos/videos computer) went belly up. This computer contained the data I use in Outlook and Quicken. Because of the crash and my frequency of using the Replicator program, I lost about three days of not-too important data. For some reason when I restored the Outlook data, some data was missing. I think it was more my improperly using the Outlook restore steps rather than the quality of my Replicator backup. But the whole episode got me thinking about my backup process and whatever vulnerability I have in this area. I decided to give Carbonite a try. I won’t really describe it here, but you can click on the link to find out more about it. Suffis it to say that it basically provides unlimited backup storage on the cloud for $60 a year for a single computer and its internal drives. For additional features and multiple computers, higher price options are available. I started my initial backup of my photos computer yesterday, which will be about 450 Gb. If I did my math right, considering what has been backed up so far, it will probably take most of a month to complete. But after that, it will only take a few minutes a day to keep the backup current. While it is doing the initial backup, I have not noticed any measurable slowing down of my computer. I continue my normal backup practices using Elements and Replicator, so I am not too concerned with the length of time the initial backup takes. Reviews and a few friends that have been using Carbonite have been positive. I do know that the company has been around for a significant length of time. I’ll keep you posted regarding how the initial backup is progressing. Comment and let me know what your experience has been using Carbonite or a similar cloud-based product.